And now for something completely different. 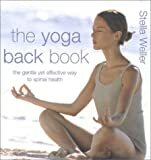 I never recommend any kind of “self-help” book, but if you’re like millions of others out there who suffer from any kind of back problem, and even if you don’t and just want to keep your back healthy, you might just like to take a peek at The Yoga Back Book by Stella Weller. She’s a registered nurse who has taught yoga and stress management to people of all ages. It’s a yoga book, but it’s not just about yoga poses. She discusses everything – essential back exercises, strong legs for strong backs, abdominal support, as well as breathing techniques, and even relaxing for a pain free back. It’s illustrated, well written, and not difficult to follow. She even shows alternative poses if you’ve got back issues already and find the traditional poses too difficult. Even if you never do a single sun salutation it’s worth reading for all the other stuff. Winter’s here, and I’m positive people have more problems with their back at this time of year than any other. Before you shovel – read this first. This is a really powerful book. My Stroke of Insight: A Brain Scientist’s Personal Journey by Jill Bolte Taylor (published by Penguin Books) is an amazing story. Jill Taylor wakes one morning in 1996 and discovers that she’s having a stroke. She’s 37 years old and is a Harvard trained brain scientist. Within hours she couldn’t walk, talk, read, write or remember any of her life. This is her story. The amazing part is that she fully recovers (but it takes many painful years), and she says the stroke was a blessing and a revelation to her. Not many people would think this, but she tells how she discovered feelings of well-being that she never experienced before. There is a very interesting chapter called “Finding Your Deep Inner Peace”… it well worth studying. She underwent brain surgery, and had to relearn everything. I can’t begin to tell you the obstacles this woman faced… talk about courage and determination! This is also a great book to read if you know someone who has had a stroke. She lists 40 things she needed the most after she had the stroke that everyone should pay attention to, such as “come close, speak slowly, and enunciate clearly”. The book isn’t large (under 200 pages) and it certainly is well worth reading. Soap and Water and Common Sense: How to Stay Healthy in a Germ-Filled World by Dr. Bonnie Henry (published by Anansi Press) is a VERY timely book. If you’re at all concerned about your health re the flu or a virus – and who isn’t right now!! – you should definitely read this book. It’s so up to date that even the H1N1(Swine) flu is mentioned. Get the facts right, learn the difference between a virus and bacteria, when and when it’s not time to call in the heavy equipment and use an antibiotic, and what can be done to protect yourself from nasties like E. Coli and Salmonella. Learn about the history of typhoid, smallpox, malaria, SARS, and even West Nile. They’re all mentioned, and all fascinating. Being bombarded daily by the media with info about the Swine flu, it gets so that you can’t sort all the facts out enough to make a consciencious decision about what to do to protect yourself. Dr. Henry lays it all out in plain English. She certainly has the smarts – she’s currently the Director of Public Health Emergency Management at the B.C. Centre for Disease Control. She is a public health physician, a preventive medicine specialist and an epidemiologist. And the title of her book just about sums it all up … soap and water & common sense goes a long way in helping us fight off a host of illnesses in our germ-filled world. For anyone who is interested in nutrition or health issues, these books are informative and full of good advice. Whenever I use the word ‘diet’ I don’t mean any low fat, low carb, low sugar, low salt, no taste book that promises you’ll lose weight but doesn’t tell you that you’ll gain it all back later. In my case ‘diet’ refers to what you eat, plain and simple. I will never, ever, recommend a diet book so if that’s what you’re looking for – you’ll have to look somewhere else. In Defense Of Food by Michael Pollan is a book I recommend separately, but I can’t emphasize enough how important this book is. It’s straight-forward, simple advice on how to eat well. Eat, Drink, and Be Healthy: The Harvard Medical School Guide to Healthy Eating by Walter C. Willet, M.D. (A Harvard Medical School book co-developed with the Harvard School of Public Health) … a VERY important book – read it! The China Study: The Most Comprehensive Study of Nutrition Ever Conducted and the Startling Implications for Diet, Weight Loss and Long-term Health by T. Colin Campbell PhD. is the world’s largest study ever undertaken in the field of nutrition. A huge book, but easy to digest. What To Eat by Marion Nestle is a walk through your local grocery store that examines our modern-day ‘diet. She is Prof. of Nutrition, Food Studies and Public Health at New York University. Healthy at 100: The Scientifically Proven Secrets of the World’s Healthiest and Longest-Lived Peoples by John Robbins examines our whole being (body,mind and soul) and focuses on cultures around the world where people live long, productive, healthy lives. The End of Food: How the Food Industry Is Destroying Our Food Supply-And What You Can Do About It by Paul Roberts is a real shocker that focuses on the modern day problems of eating the way we do and what the consequences are. The Vitamin D Cure by James E. Dowd, M.D. is a real eye-opener. I hate the title but I guess it gets people’s attention. A must-read for everyone who wonders about our current obsession with this vitamin. Survival Of The Sickest by Dr. Sharon Moalem is a really neat book. He highlights how many of today’s diseases were conditions that enabled our ancestors to actually survive, and also demonstrates how little modern medicine really understands about human health. It’s fascinating. There is a small publication (actually it’s a newsletter) called Nutrition Action Health Letter, published by the Centre for Science in the Public Interest, that I think is the best resource with current, up-to-date, information relating to health issues that you’re likely to find anywhere. It is the world’s largest-circulation health newsletter. Every issue focuses on a different topic, for instance the current one talks about how to keep your brain young. Previous issues dealt with Vitamin D, the benefits of exercise, dealing with diabetes. And every issue also examines a product that you find in your local grocery stores – this time it’s dips and spreads. One major fact about this publication – they accept no advertizing. This newsletter is not available at your local newsstand, it’s by subscription only. You can go online to their website to read archived editions since 2004, and to sign up for a subscription. It’s really cheap and well worth it. Check it out at cspinet.org/nah/canada.htm in Canada or cspinet.org/nah/index.htm in the US. … a healthy reading choice for healthy living. In Defense Of Food by Michael Pollan (published by the Penguin Group) is perhaps the best book so far to sum up how to eat well without succumbing to all the fad diets and ‘in-the-moment’ research that we know will be tomorrow’s taboo. He essentially says “eat food, mostly plants, not too much”. It is well written, easy to understand and fascinating to read. His in depth knowledge is evident and this book is not his first foray into the subject of food/eating. He also wrote The Omnivore’s Dilemma but I suggest you start with In Defence of Food if you’re just now trying to improve your diet and sort out all this mumbo-jumbo advice that we’re bombarded with about food these days. Read it and eat!